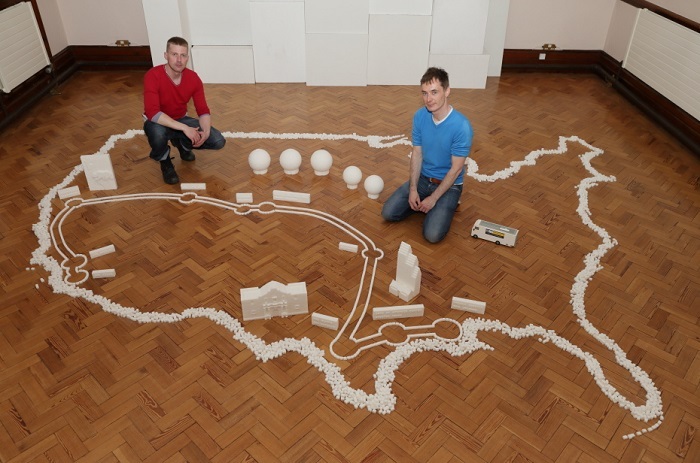 In a unique project this summer, Bangor sculptors Brendan Jamison (37) and Mark Revels (38) are travelling across the USA, creating 'Sugar America', a giant sugar cube sculpture which maps iconic buildings, vehicles and animals from across the country. It will be exhibited at 10 major cities all across the USA and will get larger and larger with each new city they roll into. Commissioned by Abbott, a global healthcare company, they are travelling in a large RV which is their 'on the road' studio, sculpting away on the highway and transporting the sculptures from stop to stop. 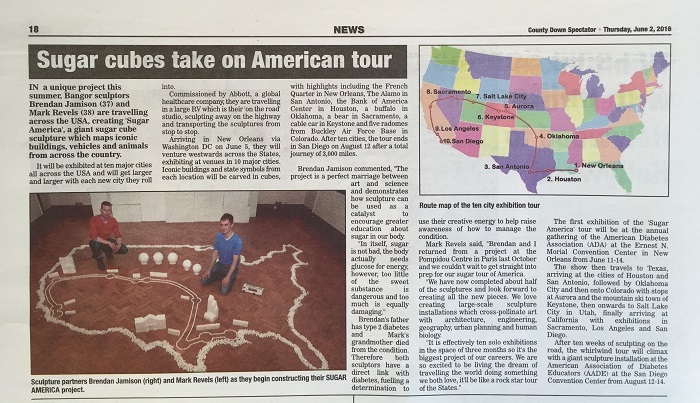 Arriving in New Orleans via Washington DC on June 5, they will venture westwards across the States, exhibiting at venues in 10 major cities. Iconic buildings and state symbols from each location will be carved in cubes, with highlights including the French Quarter in New Orleans, The Alamo in San Antonio, the Bank of America Center in Houston, a buffalo in Oklahoma, a bear in Sacramento, a cable car in Keystone and 5 radomes from Buckley Air Force Base in Colorado. 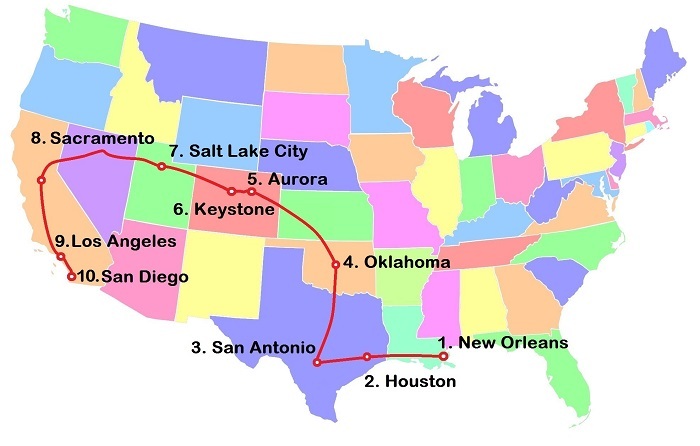 After 10 cities, the tour ends in San Diego on August 12 after a total journey of 3,384 miles! Brendan Jamison commented, "The project is a perfect marriage between art and science and demonstrates how sculpture can be used as a catalyst to encourage greater education about sugar in our body. In itself, sugar is not bad, the body actually needs glucose for energy, however, too little of the sweet substance is dangerous and too much is equally damaging." Brendan's Father has type 2 diabetes and Mark's Grandmother died from the condition. Therefore both sculptors have a direct link with diabetes, fuelling a determination to use their creative energy to help raise awareness of how to manage the condition. 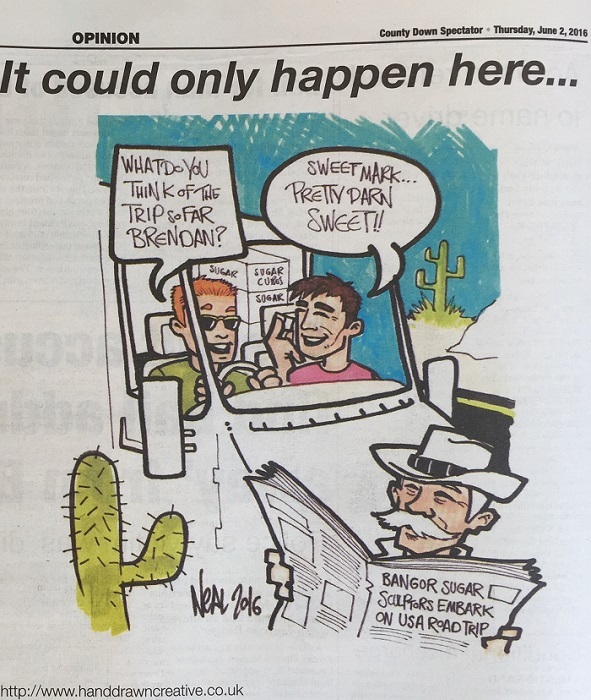 Mark Revels said, "Brendan and I returned from a project at the Pompidou Centre in Paris last October and we couldn't wait to get straight into prep for our sugar tour of America. We have now completed about half of the sculptures and look forward to creating all the new pieces from June to August on our 3 month adventure. We love creating large-scale sculpture installations which cross-pollinate art with architecture, engineering, geography, urban planning and human biology. It is effectively 10 solo exhibitions in the space of 3 months so it's the biggest project of our careers. We are so excited to be living the dream of travelling the world doing something we both love, it'll be like a rock star tour of the States!" The first exhibition of the 'Sugar America' tour will be at the annual gathering of the American Diabetes Association (ADA) at the Ernest N. Morial Convention Center in New Orleans from June 11-14. The show then travels to Texas, arriving at the cities of Houston and San Antonio, followed by Oklahoma City and then onto Colorado with stops at Aurora and the mountain ski town of Keystone, then onwards to Salt Lake City in Utah, finally arriving at California with exhibitions in Sacramento, Los Angeles and San Diego. After 10 weeks of sculpting on the road, the whirlwind tour will climax with a giant sculpture installation at the American Association of Diabetes Educators (AADE) at the San Diego Convention Center from August 12-14. 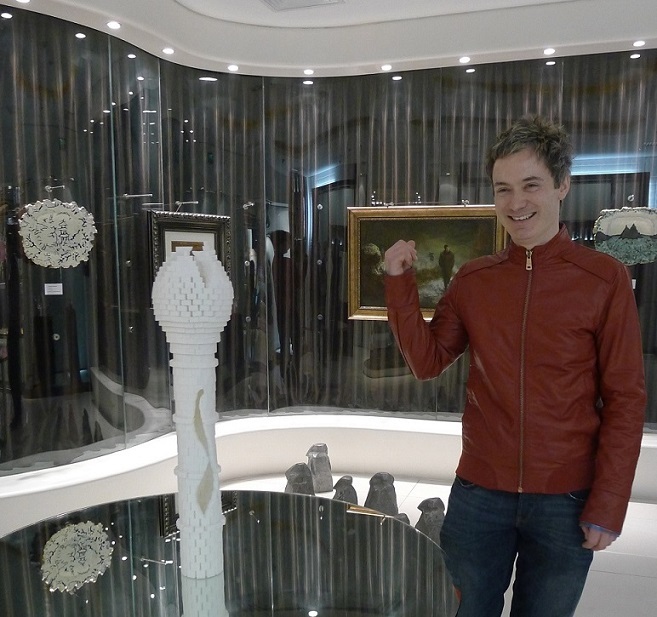 BANGOR artist Brendan Jamison has just returned from an exciting few weeks, exhibiting some of his inventive creations in Beijing, China. Here on his return, he chats to the Spectator about his creative adventure. The Great Wall, the Forbidden City, Tiananmen Square, the Bird’s Nest Stadium, the Ming Tombs, the Temple of Heaven…the allure of China sees a constant stream of visitors fly into Beijing on a daily basis from right across the globe. 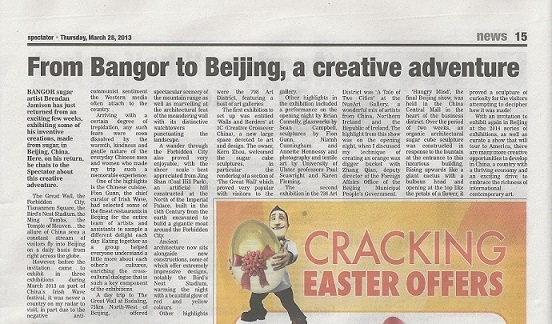 However, before the invitation came to exhibit in 3 exhibitions during March 2013 as part of China’s Irish Wave festival, it was never a country on my radar of places to visit, in part due to the negative anti-communist sentiment the Western media often attach to the country. Arriving with a certain degree of trepidation, any such fears were soon dissolved by the warmth, kindness and gentle nature of the everyday Chinese men and women who made the month of March such a memorable experience. One of the highlights is the Chinese cuisine, offering the most delicious mouth-watering selection of vegetables and meats, sweet or spicy, depending on one’s taste and the presentation itself is a glorious seduction into the artful arrangement of colour and pattern. Fion Gunn, the Chief Curator of Irish Wave, had selected some of the finest restaurants in Beijing for the entire team of artists and assistants to sample a different delight each day. Eating together as a group helped everyone understand a little more about each other’s cultures, enriching the cross-cultural dialogue that is such a key component of the exhibitions. A day trip to The Great Wall at Badaling, 75km North-West of Beijing, offered spectacular scenery of the mountain range as well as marvelling at the architectural feat of the meandering wall with its distinctive watchtowers punctuating the landscape. A wander through the Forbidden City also proved very enjoyable, with the sheer scale best appreciated from Jing Shan (Coal Hill Park), an artificial hill constructed at the North of the Imperial Palace, built in the 15th Century from the earth excavated to build a gigantic moat around the Forbidden City. Ancient architecture now sits alongside new constructions, some of which offer extremely impressive designs, notably the Bird’s Nest Stadium, warming the night with a beautiful glow of red and yellow colours. From a creative perspective, the 798 Art District is every artist’s dream. In a square block comprising of over 130 galleries, some gigantic, others more intimate, the zone is located in the North-East of Beijing. Originally a factory district designed in the 1950s by East Germans in the world-renowned Bauhaus Style, over the past decade, the industrial companies have vacated the area and the spaces have now become transformed into stunning art galleries. The Bauhaus architecture focuses on maximising the flow of natural light into spaces and therefore the adoption of the factories into art galleries seemed like a perfect evolution. And now the 798 Art District is a thriving creative hub, aside from the world-class galleries, the area is buzzing with friendly cafes and coffee shops, catering to both Western taste and traditional Chinese flavours. The first exhibition to set-up was entitled ‘Walls and Borders’ at 3C (Creative Crossover China), a new large space devoted to art and design. 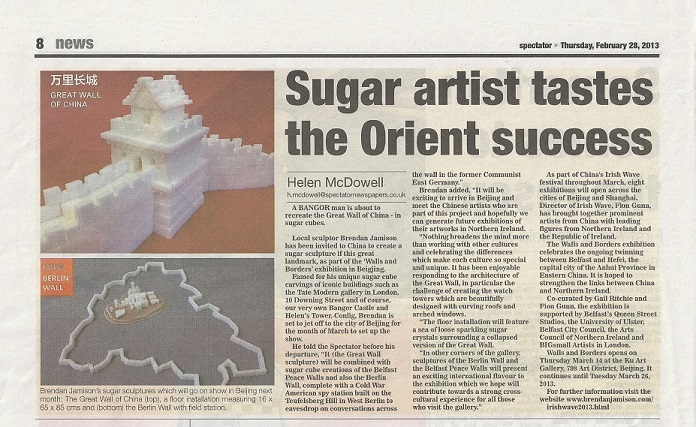 The owner, Kern Zhou, welcomed the sugar cube sculptures, in particular the rendering of ‘The Great Wall’ which proved very popular with visitors to the gallery. 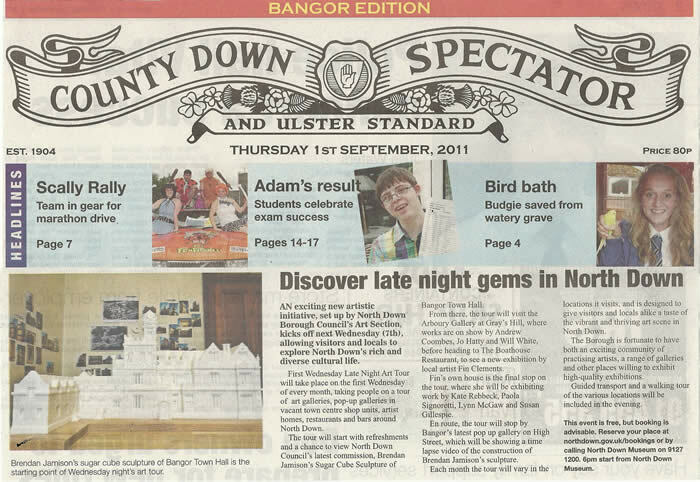 Other highlights in the exhibition included a performance on the opening night by Brian Connolly, glass works by Sean Campbell, sculptures by Fion Gunn, Niamh Cunningham and Annette Hennessy and photography and textile art by University of Ulster Professors Paul Seawright and Karen Fleming respectively. The second exhibition in the 798 Art District was ‘A Tale of Two Cities’ at the NuoArt Gallery, a wonderful mix of artists from China, Northern Ireland and the Republic of Ireland. The highlight from this show was on the opening night, discussing the technique of creating an orange wax digger bucket with Zhang Qian, Deputy Director of the Foreign Affairs Office of the Beijing Municipal People’s Government. Her positive energy and engagement with all the works in the exhibition was conveyed through her official opening speech that was met with widespread applause. ‘Hungry Mind’, the final Beijing show was held in the China Central Mall in the heart of the business district. Over the period of two weeks, an organic architectural sugar cube sculpture was constructed in response to the fountain at the entrance to this luxurious building. Rising upwards like a giant cactus with a bulbous head and opening at the top like the petals of a flower, it proved a sculpture of curiosity for the visitors attempting to decipher how it was made! 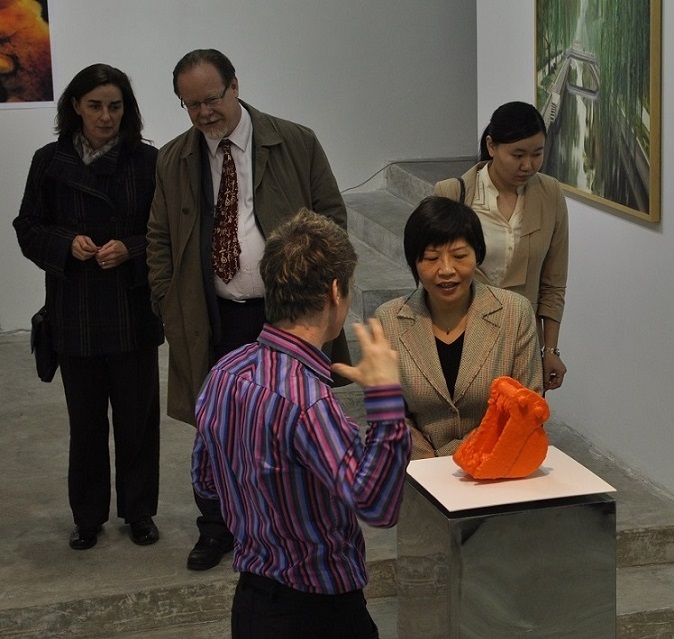 With an invitation to exhibit again in Beijing at the 2014 series of exhibitions, as well as curate a show that will tour to America, there are many more creative opportunities to develop in China, a country with a thriving economy and an exciting drive to embrace the richness of international contemporary art. 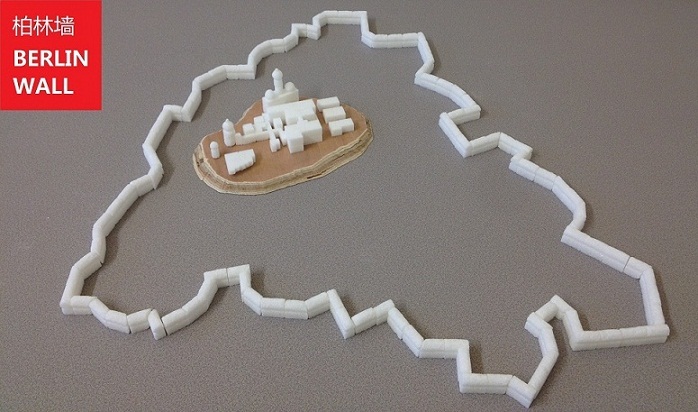 A BANGOR man is about to recreate the Great Wall of China - in sugar cubes. 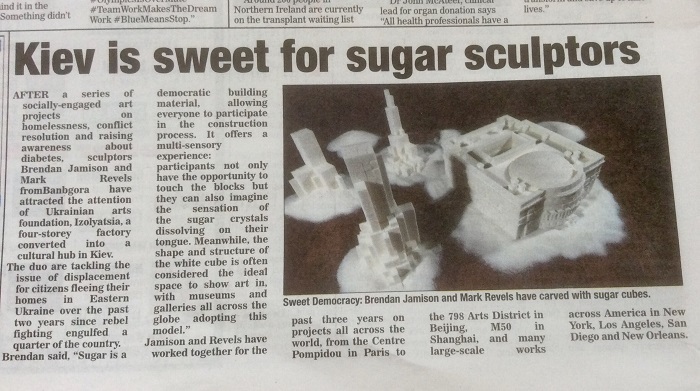 Local sculptor Brendan Jamison has been invited to China to create a sugar sculpture of this great landmark, as part of the 'Walls and Borders' exhibition in Beijing. He told the Spectator before his departure, "it (the Great Wall sculpture) will be combined with sugar cube creations of the Belfast Peace Walls and also the Berlin Wall, complete with a Cold War American spy station built on the Teufelsberg hill in West Berlin to eavesdrop on conversations across the wall in the former Communist East Germany." 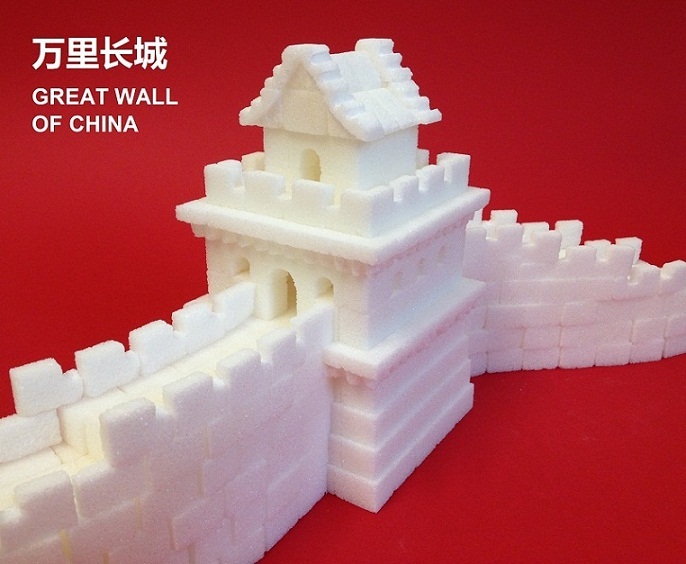 Brendan Jamison's sugar cube sculptures which will go on show in Beijing next month: The Great Wall of China (top), a floor installation measuring 6 x 65 x 85 cms and the Berlin Wall with field station. 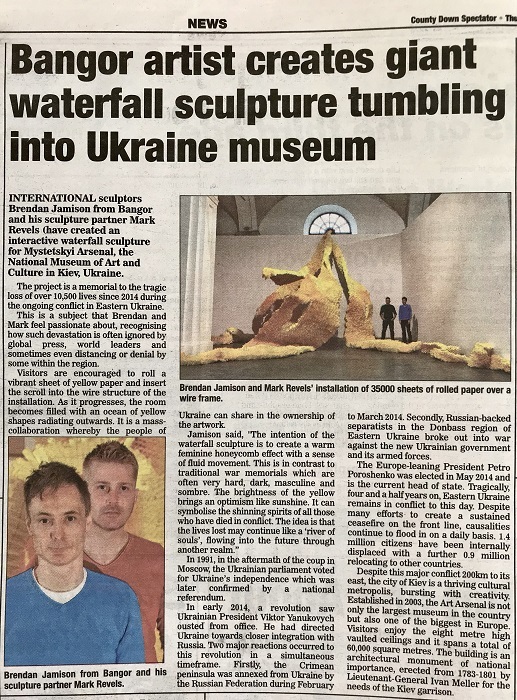 Brendan added, "it will be exciting to arrive in Beijing and meet the Chinese artists who are part of this project and hopefully we can generate furture exhibitions of their artworks in Northern Ireland." "Nothing broadens the mind more than working with other cultures and celebrating the differences which make each culture so special and unique. It has been enjoyable responding to the architecture of the Great Wall, in particular the challenge of creating the watch towers, which are beautifully designed with curving roofs and arched windows. "The floor installation will feature a sea of loose sparkling sugar crystals surrounding a collapsed version of the Great Wall." 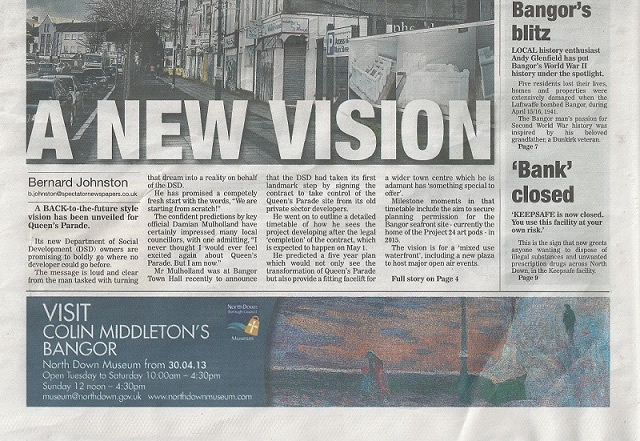 "In other corners of the gallery, sculptures of the Berlin Wall and the Belfast Peace Walls will present an exciting international flavour to the exhibition which we hope will contribute towards a strong cross-cultural experience for all those who visit the gallery." As part of China's Irish Wave festival throughout March, eight exhibitions will open across the cities of Beijing and Shanghai. 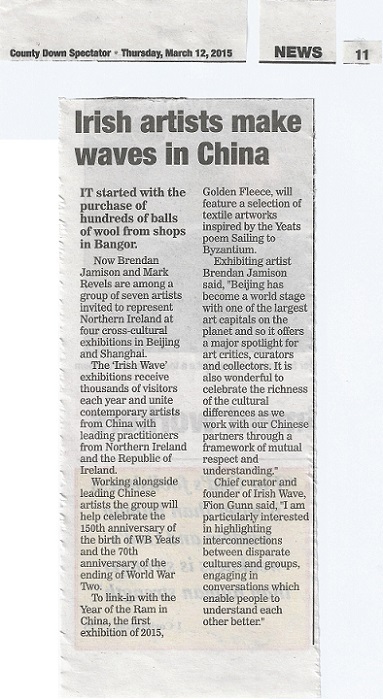 Director of Irish Wave, Fion Gunn, has combined prominent artists from China with leading figures from Northern Ireland and the Republic of Ireland. The ‘Walls and Borders’ exhibition celebrates the ongoing twinning between Belfast and Hefei, the capital city of the Anhui Province in Eastern China. It is hoped to strengthen the links between China and Northern Ireland. 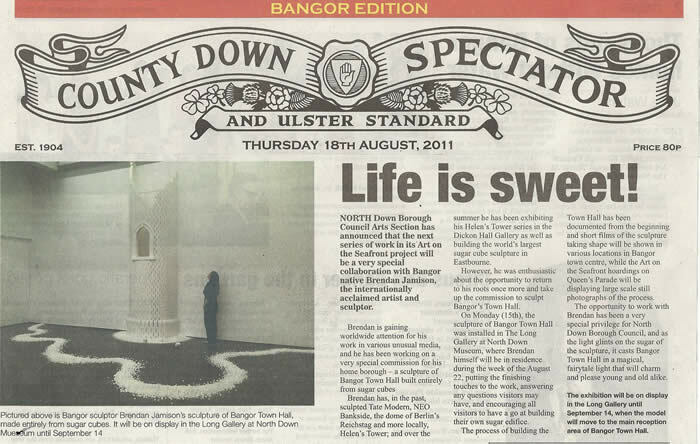 Co-curated by Gail Ritchie and Fion Gunn, the exhibition is supported by Culture Ireland, Belfast’s Queen Street Studios, the University of Ulster, Belfast City Council, the Arts Council of Northern Ireland and BIGsmall Artists in London. 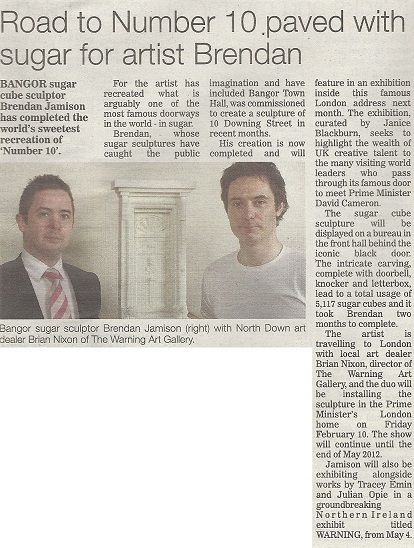 Bangor artist Brendan Jamison (33), famed locally for last year's sugar cube commission of the Town Hall and 'Art on the Seafront' billboard series, has recently been elected to the Royal British Society of Sculptors (RBS). 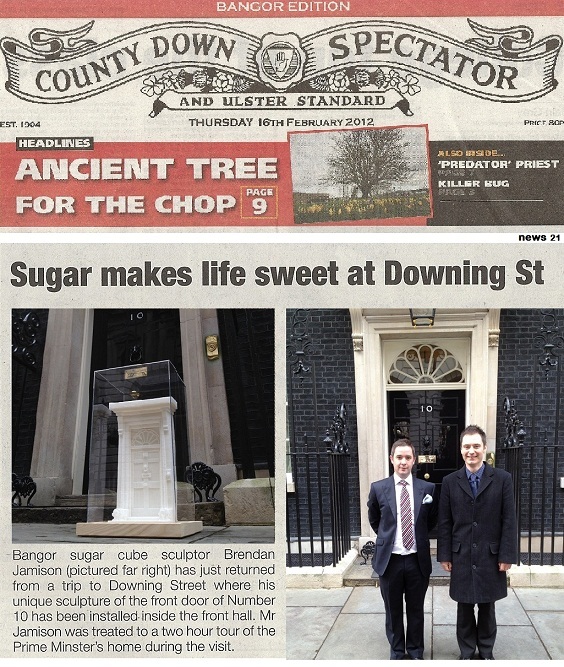 High-profile 2012 projects in London, including a current exhibition on show at 10 Downing Street and a sculpture of Henry Tate's Mausoleum were the icing on the cake for the society's council who voted him in unanimously. 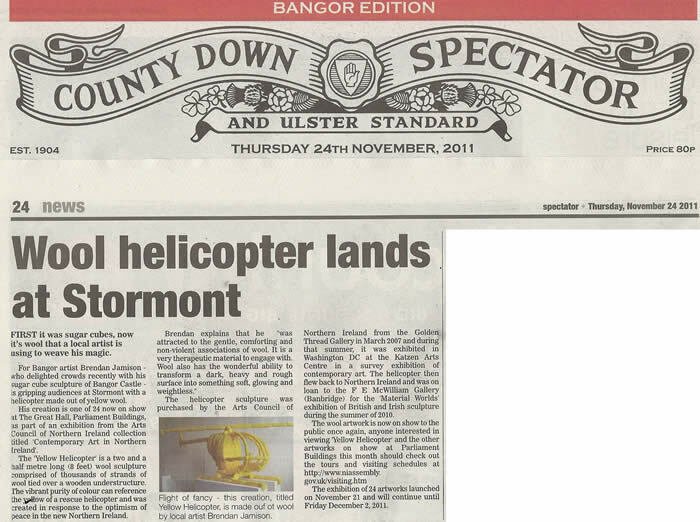 Only the second artist from Northern Ireland to be granted the ARBS title after his name, Brendan describes how “it is a great honour to join the ranks of Sir Anthony Caro and the many other sculptors across the UK who have made such significant advances in the field of sculpture and education, with the effects rippling across the entire world." Established in 1905 with 51 members, the Society received royal patronage in 1911 for its services to the art of sculpture. 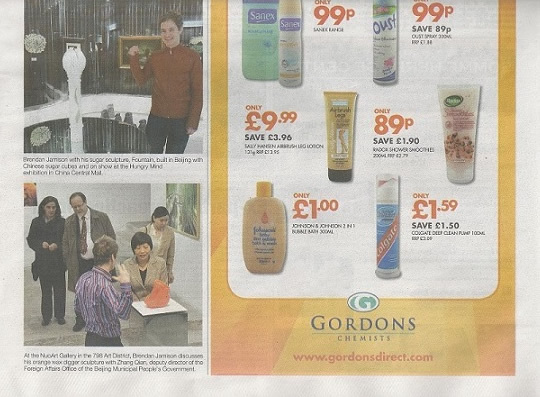 The RBS is located in London's South Kensington and Her Majesty Queen Elizabeth II is the current patron. 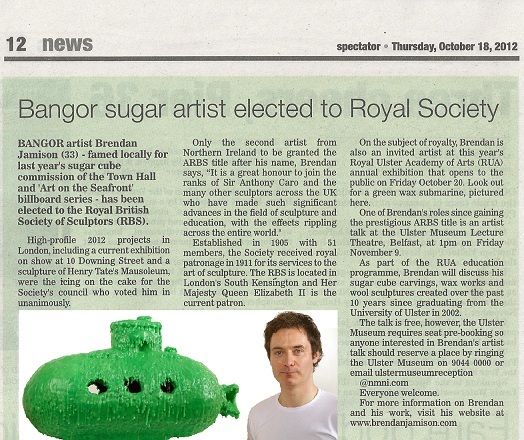 On the subject of royalty, Brendan is also an invited artist at this year's Royal Ulster Academy of Arts (RUA) annual exhibition that opens to the public on Friday 19 October. Look out for a green wax submarine, pictured here. 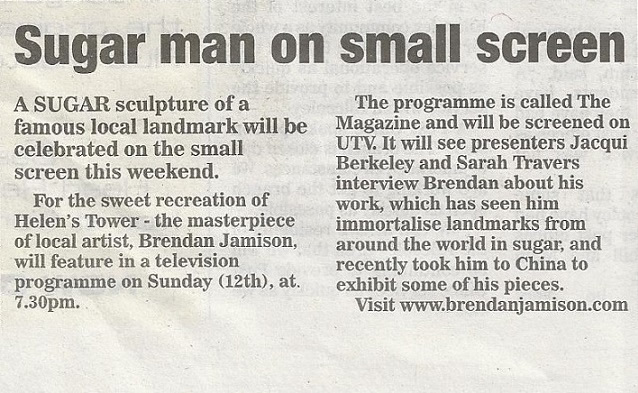 One of Brendan's roles since gaining the prestigious ARBS title is an artist talk at the Ulster Museum Lecture Theatre at 1pm on Friday 9 November. 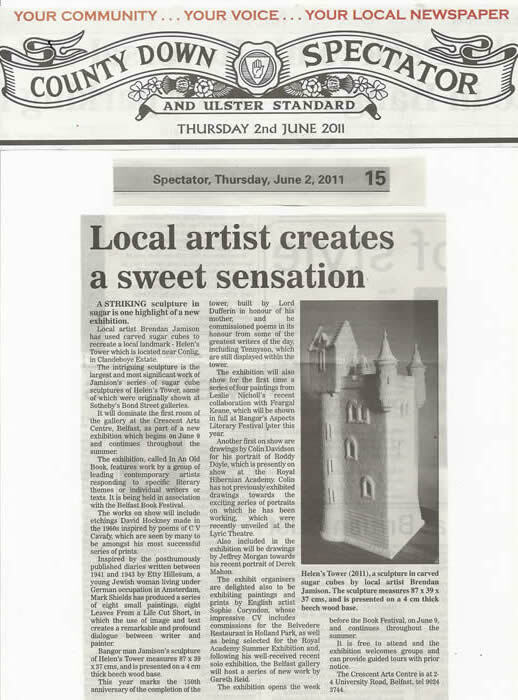 As part of the RUA education programme, Brendan will discuss his sugar cube carvings, wax works and wool sculptures created over the past 10 years since graduating from the University of Ulster in 2002. 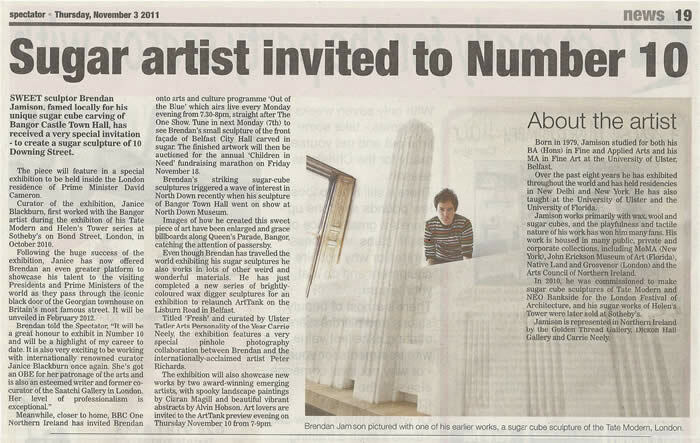 The talk is free, however, the Ulster Museum require seat pre-booking so anyone interested in Brendan's artist talk should reserve a place by ringing the Ulster Museum on 02890 440 000 or email ulstermuseumreception@nmni.com Everyone welcome. 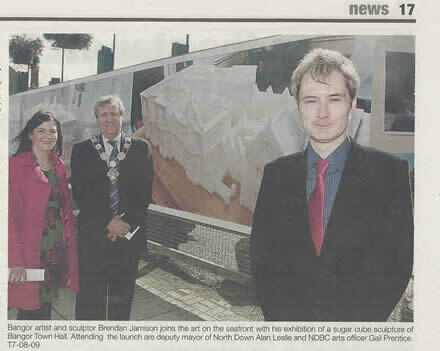 Mayor of North Down Alan Leslie and NDBC Arts Officer Gail Prentice. 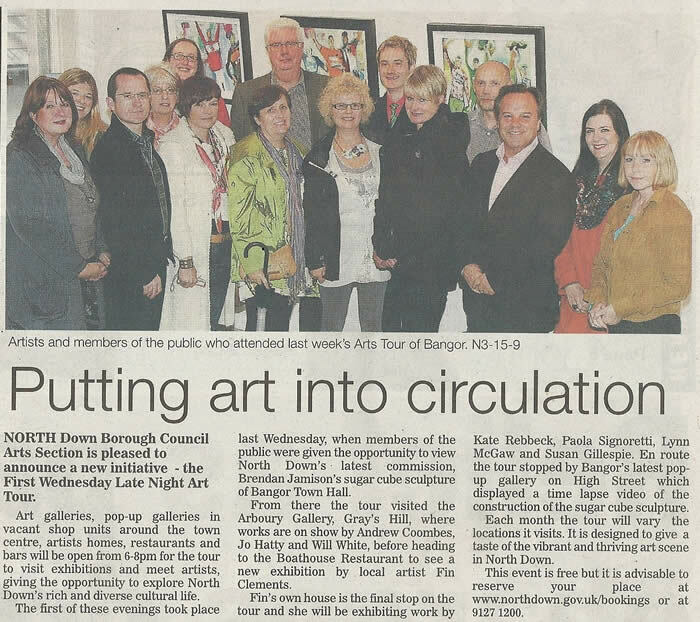 allowing visitors and locals to explore North Down's rich and diverse cultural life. 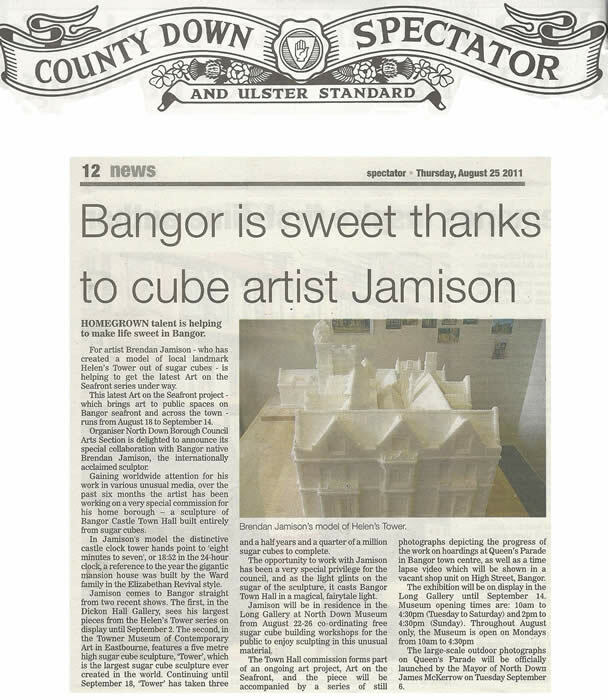 Jamison's Sugar Cube Sculpture of Bangor Town Hall. Paola Signoretti, Lynn McGaw and Susan Gillespie. lapse video of the construction of Brendan Jamison's sculpture. 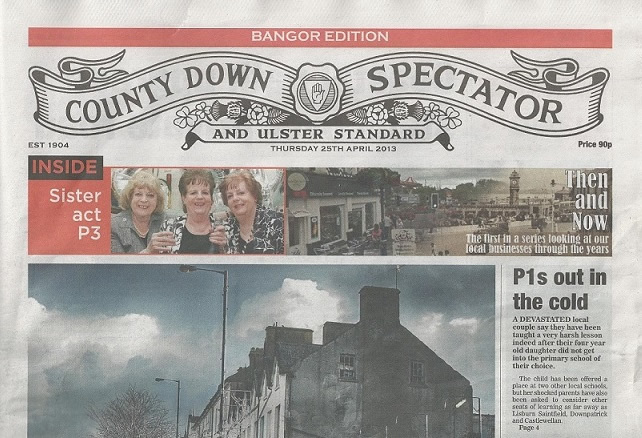 the vibrant and thriving art scene in North Down. will be included in the evening. North Down Museum on 02891271200. 6pm start from North Down Museum.